Introduction: Let’s set the scene. You arrive at the mall and right inside the entrance is one of those “whirlpool” plastic donation stands where you can watch your coins travel round and round until being swallowed along with all the other coins going to charity. This classic analogy of a potential well is used all the time, so now I want to use it for galaxy clusters. This means the “coins” which we watch whizzing around in the potential are galaxies. Now when I say “whizzing”, from our point of view I really mean “crawling” relative to the size of the cluster. On this new scale, the coins descending into the maw of charity would be moving at 1 nm a year! On the cluster scale, they are moving ~1000km/s. As is true with any study where you can’t know everything and make assumptions, there is an induced scatter in what you estimate and the true value since some systems will deviate from your generalizations. With galaxy clusters, a lot of work is being put into understanding these types of scatter in different mass estimators. When we look at a galaxy cluster, we are seeing a 2D projection. Information about that third dimension is extremely difficult to acquire, so we are left to make assumptions about the geometry of the cluster. One assumption you make with clusters is that they are spherical, but that is only true for the most stable and isolated clusters, so that induces scatter in what you estimate the mass to be relative to the actual cluster mass. What about the equation to go from velocities to mass? It assumes dynamical or virial equilibrium, which is not true when galaxies are infalling into the cluster or a cluster merger is occurring. The sum of all these assumptions can be anywhere from 10-30% scatter, so there have been attempts to measure masses in different ways. One clever way of doing this is looking for a distortion in the Cosmic Microwave Background (CMB) temperature. This distortion is the result of inverse-Compton scattering of CMB photons as they interact with the hot electrons in the intracluster medium (ICM) of the galaxy cluster and shows up as a depletion of photons (abnormal cool spot). This is known as the Sunyaev-Zel’dovich Effect (SZ). Both the Atacama Cosmology Telescope (ACT) and the South Pole Telescope (SPT) are covering cosmologically significant areas of the sky in order to pick up these signals. With these larger samples, the teams hope to find a relationship between mass and SZ signal which can put tighter constraints on cosmological parameters. The Study: Here the authors look at a sample of 16 clusters with SZ signals and spectra of their member galaxies. The redshift range of the clusters span 0.28 < z < 1.07 with a median redshift of z=0.50. The dynamical mass estimates are made using a velocity dispersion-mass scaling relation in Evrard et al. (2008). The 16 clusters they wind up with have minimal visible substructure which, as I mention above, can change the mass estimates due to deviations from being spherical. The authors look at three different SZ estimators. The first two use something called a match-filtered technique to find the SZ signal either in the brightest pixel or over a region. The third method uses information about the cluster like the redshift to integrate over the entire signal. For the third estimator, it is safer to integrate over a larger region to avoid affects from physics like AGN feedback and projection effects. 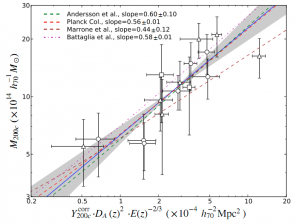 The scaling relation between the SZ "Y" parameter and dynamical mass. The scatter is about 11%. When the two estimators are compared, the authors find a relationship with a scatter of ~11% for the velocity dispersion mass-integrated SZ parameter! In addition to this comparison, the group also find that their sample contains some of the most massive clusters in the known universe. The largest, name ‘El Gordo’, weighs in at 2.2 x 1015 solar masses! The scaling relations agree with expectations and increase the author’s confidence in using the SZ effect for detecting and characterizing massive clusters as well as constraining cosmological parameters. The Bullet Cluster – A Smoking Gun for Dark Matter! Astrobites: A Look back at 2016! 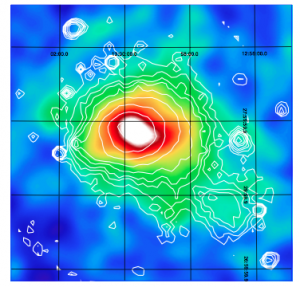 Galaxy Clusters, Cosmology, and Beethoven’s No. 6 What is the Most Massive Object in the Universe?